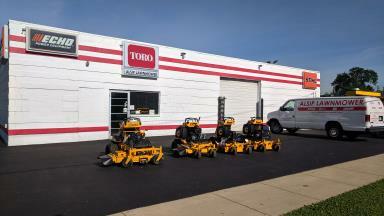 Toro, Wright, Echo, & Stihl. Certain models sell very quickly, so if there is a particular model that you are interested in, please call our store and we can let you know if we currently have it in stock! If your power equipment needs parts or servicing, our certified technicians will properly diagnose your problem and repair it promptly. Our technicians can also perform regular and preventative maintenance, such as tune-ups, to keep your equipment in great condition. Alsip Lawnmower Repair has been proudly serving customers in the southern Chicagoland region for over 20 years by selling and servicing outdoor power equipment for both residential and commercial users. Over the years, we have developed a large group of loyal customers that we see year after year, whether they need to purchase new equipment, service their existing equipment or look-up replacement parts.